OMG Zombies is one of those games I seem to keep coming back to. I first found this little gem back in the PSP Mini's library and really enjoy it's unique style and strategic gameplay. I later purchased the upgraded title for my Vita and enjoyed it over once again. So of course I jumped at the idea of getting into the beta for the steam version and found myself playing it more than ever. 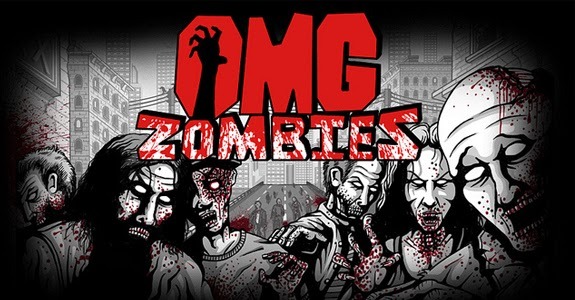 In OMG Zombies you take the role of a survivor/shooter, perched on top of something higher than the Zombie horde below you on a 2D single screen, encompassing the various obstacles and challenges of each map. Armed with just a sniper rifle and 3 bullets (which you can upgrade to 6 as you earn cash by completing levels), you are tasked with taking out the entire screen's worth of undead. An impossible task if one bullet equaled one zombie death, but this is where OMGZ's strategy comes into play. Each and every zombie in the game has a chain reaction ability which helps take out other zombies around it. Some explode, some fire off gunshots of their own, others run through the level screaming (taking out others at their destination), some even melt into acid; all of which helps clear the screen and earn you the higher ranking, providing you with more cash and allowing you to beef up your abilities. Each level has a Bronze, Silver, Gold and Platinum medal to acquire, each earning you more cash for upgrades. Don't get discouraged if you can only pull off the lower medal awards at first, it'll become easier once you've spent some of that award money on upgrades. Better medals open up more and more of the 100 levels included and you can go back any time to any level and try for a higher score; some levels being clear-able in a single shot if timed right. Thankfully the mouse is the most precise tool for the shooting, giving you an advantage over it's previous versions (on PSP/Vita). The game runs wonderfully in windowed mode and goes along at such a pace that you can continually go back to it between browsing and chatting if you prefer (which I liked during my play for this review). What unfolds is a game that feels a little over-powering at first, as you clamor to get even a silver medal, then opens up and gives you the upper hand as you progress, only to keep challenging you with levels that make you wonder how even 6 bullets will help you be victorious. Sometimes timing is key and you can sit there with hand on mouse for what feels like forever, trying to line up the perfect chain reaction. Then when you've completed all 100 levels on platinum, you have the choice to start all over again in a prestige mode, in which you lose all your upgrades and must start from level 1 again. Reminding yourself just how hard it was starting out. If you're brave enough and have some serious time to dedicate to it, the game has an achievement for prestige-ing 20 times over. The game isn't a super action romp and you shouldn't get it thinking it is. It's a strategic game that employs a very well ramped difficulty curve which makes for an engaging and addicting experience. I've enjoyed my time with it and feel it's well worth the asking price.